Social capital helps communities respond positively to change. Research in agricultural businesses and into managing change through learning in communities, has highlighted the importance of relationships between people and the formal and informal infrastructure of communities to the quality of outcomes experienced by communities, businesses and individuals. Communities can be geographic communities - the data drawn on in this paper is from an island community, for example - or communities-of-common-purpose, such as agricultural organisations. 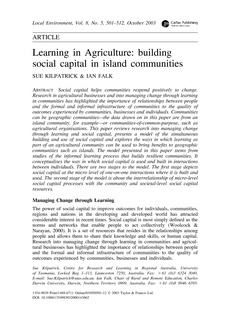 In this paper we review research into managing change through learning and social capital, present a model of the simultaneous building and use of social capital and explore the ways in which learning as part of an agricultural community can be used to bring benefits to geographic communities such as islands. 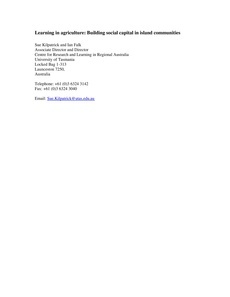 The model presented in this paper stems from studies of the informal learning process that builds resilient communities. It conceptualises the way in which social capital is used and built in interactions between individuals. There are two stages to the model. The first stage depicts social capital at the micro level of one -on-one interactions where it is built and used. The second stage of the model is about the interrelationship of micro level social capital processes with the community and societal level social capital resources.